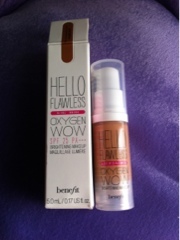 I picked up a sample of the Benefit Hello Flawless Oxygen Wow foundation with a Boots advantage card voucher a few weeks ago from the Benefit counter at the larger Boots store. As this was before the launch date for the foundation, the full range of shades wasn't available to try out and I was given the shade "I'm Hopelessly Hot" Hazelnut to take with me. Considering that I wasn't matched at the counter, the foundation is slightly darker than my skintone when applied using a brush (I use the E.L.F studio powder brush) although this doesn't really matter when I'm wearing my scarf because no one can see if there is a slight difference between my face and neck. I'd personally go for the shade lighter which is "I'm so Glamber" Amber, simply because it's easier to warm up a foundation rather than make it lighter. I love the pump dispenser as it means you can control how much foundation is dispensed rather than pouring it out (thus creating a horrible mess). Despite not being a big fan of liquid foundations, I do like that the Benefit HFOW is light-medium coverage foundation and it doesn't feel heavy or sticky on the skin. The sun protection factor of SPF 25 PA+++ also makes it great for the upcoming Summer months (even though the weather seems to be otherwise at the moment). Even though there are only 9 shades available, they cover a range of skin tones from fair/porcelain to deep mocha complexions. 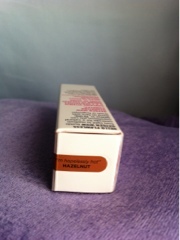 I am going to purchase the full size 30ml foundation which retails at £24.50 (although not at this moment in time. Maybe as a treat after exams?). What liquid foundations would you recommend? Nice review :) I've heard good things about this! I'm looking forward to trying it out and I'm glad they're catering towards people of darker skin! I love that it's not too heavy, it's great for daytime wear.